In Mac OS X, you’ll spend much of your time in the Finder, the part of your operating system that manages files and such. While you might think you know all there is to know about it, the Finder is a complex and wonderful app — with its own special tricks to master. Here are 10 essential Finder tips that will help you get the most out of your time working or playing on your Mac. Even cooler? Getting a full-screen slideshow, complete with available index sheet, by hitting Option-space bar with several files selected. You’ll be able to scroll through them all with the arrow keys, either onscreen or on your keyboard, and if you click the little Index button, you’ll see all your selected files on one screen. Click on the one you want to see full-size, or hit Esc to get back to the Finder. Your Home folder contains all your stuff, including documents, photos and music. It makes sense to show it in the Finder’s Sidebar, which is itself a collection of all the things you use often. 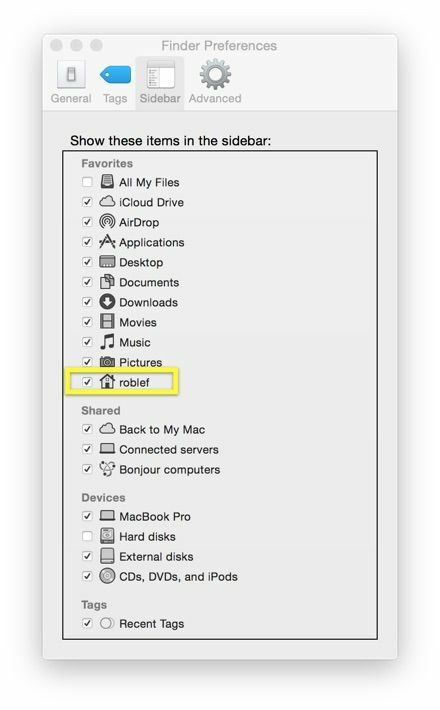 To make the Home folder show up, simply choose Preferences from the Finder menu (or hit Command-comma when you’re in the Finder). Then click the little checkbox to the left of your Home folder’s name. 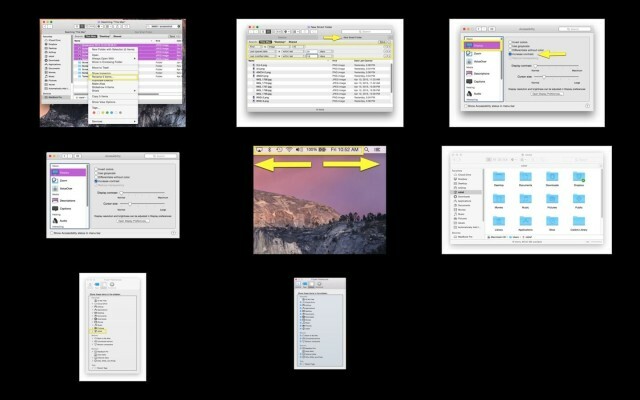 Then open a Finder window and drag and drop your Home folder wherever you’d like it. I like to keep it near the top of my sidebar items. 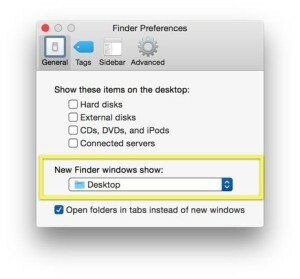 These two bars reside at the bottom of any Finder window, giving you important info about your Mac. 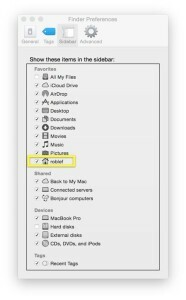 The Status bar will show you how many items you have in a specific folder as well as how much free storage you have left on your hard disk, while the Path bar will show you the folder path of any highlighted file or folder in the Finder. Both are useful, and both can be enabled in the View menu. 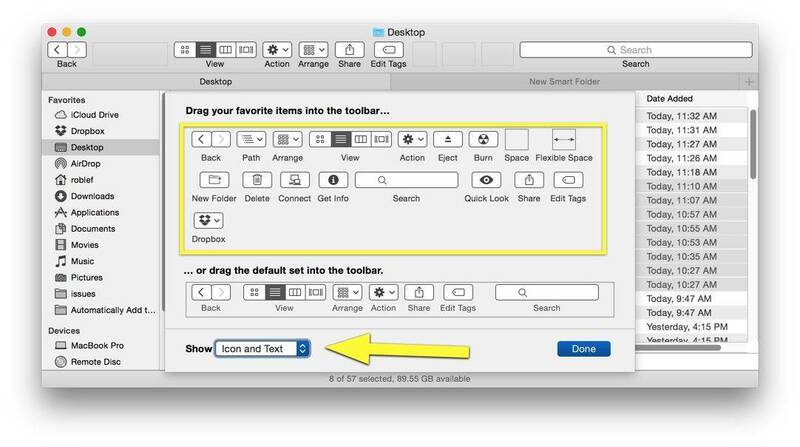 Simply select Show Path Bar or Show Status bar from the View menu in the Finder, or hit Command-/ or Option-Command-P to show and hide them, respectively. If your menubar is loaded with a ton of status icons, you can reorder them and even make them disappear. To rearrange them, simply hold down the Command button on your keyboard, then drag and drop the icons into the order that most pleases you. This applies to the Apple-provided ones, mostly, as third-party apps don’t necessarily allow this trick. 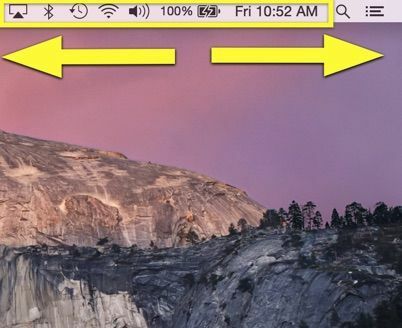 If you want to get rid of the icons, simply Command-click and drag one of the menubar icons toward the middle of the screen. When you let go, the menubar icon will disappear in a cute little puff of simulated smoke, just like when you drag an icon off the Dock. Nice, huh? 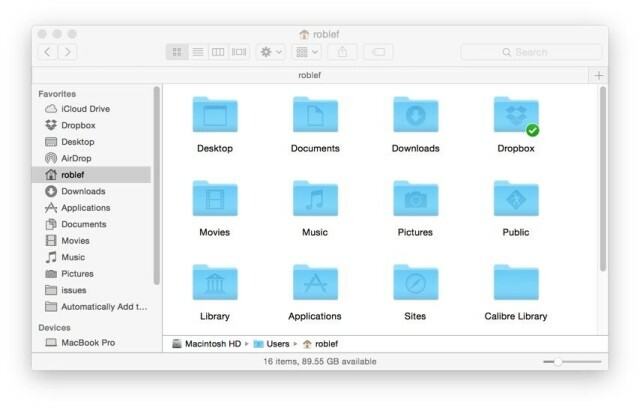 OS X’s look has gotten flatter and less skeuomorphic these days, but if you have a need for an even sharper, more contrasty look, you’re in luck. 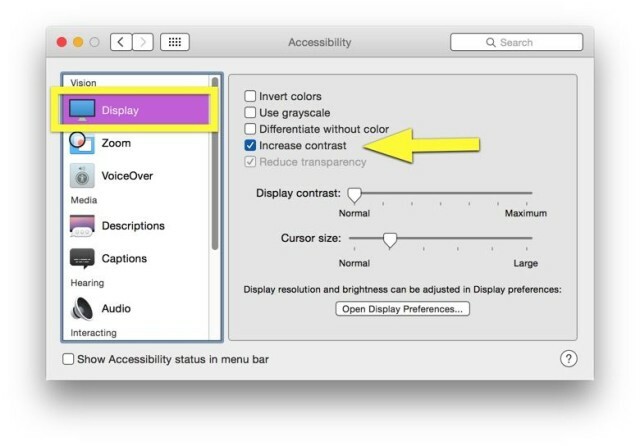 Simply launch System Preferences, click on Accessibility, and then click on Display in the left pane. Click the checkbox next to Increase contrast to get a more OS 9-like look, complete with darker colors and lighter backgrounds. If you want to kick up the contrast another notch, head to the General section of System Preferences and check off the “Use dark menu bar and Dock” option, just under the Appearance drop-down menu. 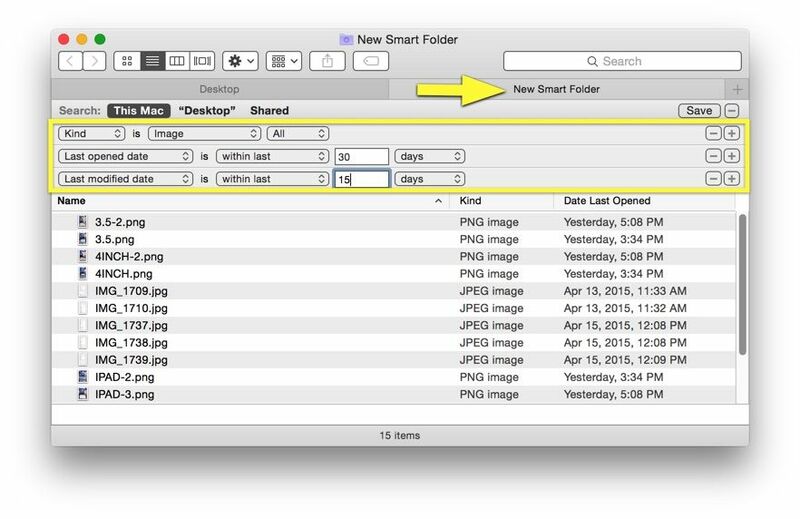 Smart Folders can be super-useful, as they collect files or apps into one folder according to specific criteria set up by you. 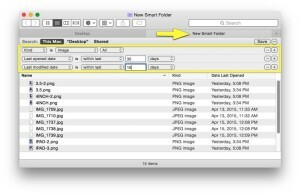 To make one, simply choose New Smart Folder from the File menu in the Finder. You can also hit Command-Option-N on your keyboard, then type in a topic, phrase or other parameter into the search field. 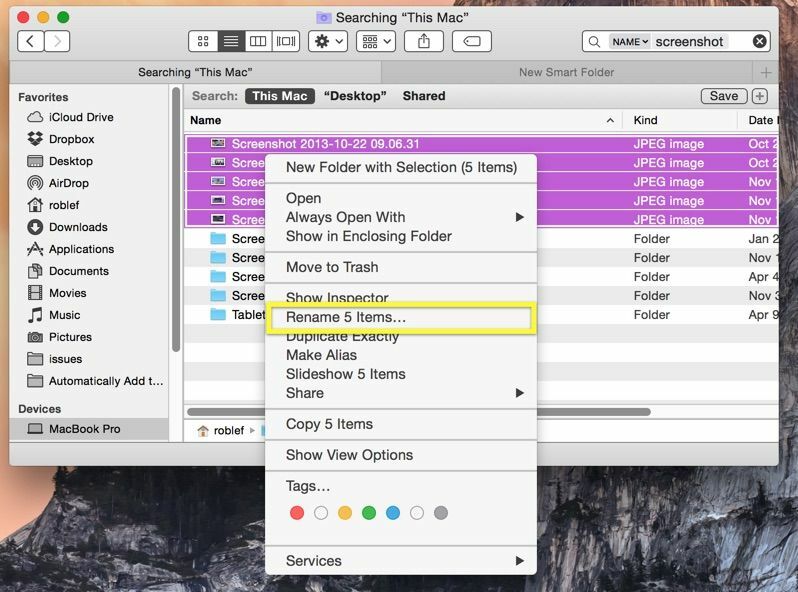 Pro tip: just like when you’re searching in a regular window in the Finder, you can limit the search to only the names of files by choosing “Name matches” in the menu that appears, and clicking on Name, then Filename. You know when you have 47 different files, all named Screenshot? Well, it’s super-easy to rename them all to something better, like Cat Pictures, right in the Finder. All you need to do is select all the files you want to rename, then right-click (or Control-Click) on any of them. Next, click on the contextual menu item “Rename X Items,” where X is the number of files you’ve selected. Then you can do a simple replace text rename, add text to the end of the current file name, or append a number, counter or date at the end using the pop-up menu provided. It’s pretty robust — give it a try. 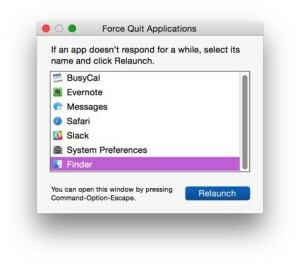 There comes a time when even the hardiest app on your Mac, the Finder, will freeze or crash. You can always reboot at times like this, or shut down with a long press and hold to your power button, but try to relaunch the Finder first. It’s just like Force Quitting any other app — simply hit the Option-Command-Esc key combination to bring up the Force Quit dialog box. You may need to Command-Tab your way to a different, non-crashed app first to see it. Once you see the dialog, highlight the Finder in the list and click Relaunch. 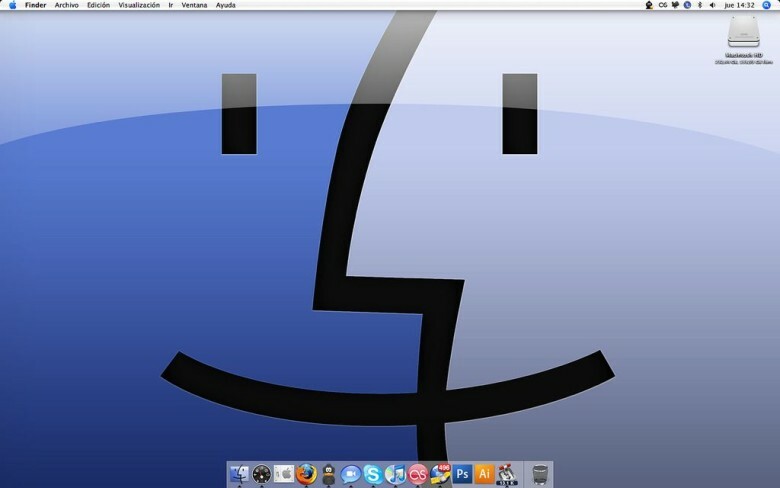 This can save you some valuable time as an alternative to rebooting your whole Mac. There’s a wealth of helpful widgets and buttons at the top of any Finder window, and for the most part, the default set will do you just fine. If, however, you want to add or delete anything up there, all you have to do is right-click (or Control-Click) on an empty space in the toolbar itself and choose Customize Toolbar from the contextual menu that pops up. Then drag and drop to your heart’s content, or — to reset it — drag the default set up from the bottom of the panel. Pro tip: Choose Icon only, Text only or Icon and Text for a more- or less-informative look to the set of icons in the toolbar. When you open a Finder window, it defaults to a specific folder (usually Home). If you want a different folder to appear when you open a new Finder window, click on the Finder menu, then Preferences (or hit Command-Comma when in the Finder). 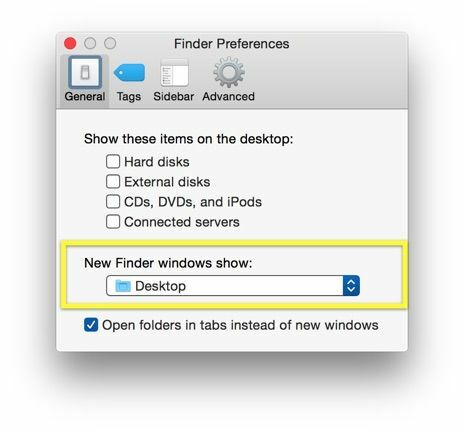 You’ll be able to choose any folder from the drop-down menu “New Finder windows show” item. When you click there, you’ll get some suggestions, like your hard disk, your Home folder and All Files. Or you can choose Other and navigate to whatever folder you want. Like a boss.